So what have we been doing? Four days after leaving Glacier…we’ve been doing a lot! Our first stop was Bertz RV in Missoula to get a leaky water pump fixed. They have spaces with electric and water hookups - so, Sunday night we stayed in their lot. 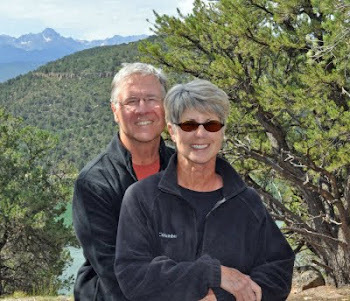 It was clearly a bit of culture shock when compared to our 9 weeks in Apgar campground. Mission accomplished. Overall we were very impressed with their service and they had us back on the road at 11:00 AM Monday morning. As so often happens: we are traveling down the highway when JoAnne will spot one of those brown and white signs that signify something of historical interest. 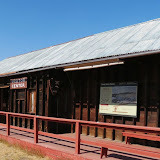 This was the case just outside of Deer Lodge, Montana where she spotted the sign for the Grant-Kohrs Ranch, National Historic Site. It was interesting, however the main focus of the stop was to see the interior of the ranch residence – but to our disappointment and neglect to research the place first, we were disappointed. The ranch and outbuildings are having a fire suppression system installed so the “main attractions” were closed. However, we did get to see the location and exteriors, plus wonderful short and longhorn cattle. Factoid: At one time, this ranch consisted of over 10 million acres! As we headed out of the ranch it was mid-afternoon and time to find a place to stop for the night. After consulting several of our iPhone Apps we settled on Divide Bridge Campground a BLM site along the Big Hole River. What a perfect place to relax with a glass of wine and spend the evening reminiscing of our time at Glacier National Park and sleeping to the sounds of the cascading river. One of the fun, interesting and educational things we like to do while travelling, is to stop at historic places along our journey. On this day we accomplished that with our stop at the Big Hole National Battlefield, 10 miles outside of Wisdom, Montana. We first became interested in the Nez Percé and Chief Joseph on a previous trip to Oregon with our good pals Lois and Hal Leslie. Big Hole National Battlefield is actually a memorial to commemorate the place where the Nez Percé fought a delayed action against the 7th Infantry Regiment on August 9 and 10, 1877, during their failed attempt to escape to Canada. The Battle of the Big Hole was the largest battle fought between the Nez Percé and U.S. Government forces in the five-month conflict known as the Nez Perce War. They have a well-done and informative movie along with extraordinary artifacts in their visitor center. After leaving the battlefield we headed toward Salmon, ID on highway 93. This route is known as the Salmon River Scenic Byway. And the name does not mislead. This had to be one of the most scenic roads we have traveled. 93 twists and turns as it shadows the Salmon River. Rugged mountain vistas, cattle dotted valleys, a beautiful river, and plenty of wildlife - this route pretty much has it all. Oh, the fact that fall was showing off its color didn't hurt.